India needs to grapple with a growing Chinese naval presence in its strategic backyard. India’s decision to send the warship INS Shivalik to participate in a multilateral naval exercise at the northeastern Chinese port city of Qingdao last week generated some curiosity among maritime watchers. The naval exercise, meant to commemorate China’s 65th anniversary, was held alongside the Western Pacific Naval Symposium (WPNS) – the first time China has ever hosted the meet. Beijing had earlier cancelled a fleet-review planned to precede the exercise, citing “special conditions” occasioned by the ongoing efforts to locate the lost airliner MH370 in the Southern Indian Ocean. The thrill of seeing Indian and Pakistani naval ships in the same photo-frame, however, is unlikely to have shifted the focal point of analytical interest: the emerging India-China maritime dynamic. As “routine” as official sources sought to portray India’s participation in a People’s Liberation Army Navy (PLAN) organized maritime exercise, it came laden with symbolism and strategic possibility, making it apt for a deeper examination. To begin, it is important to see the Indian Navy’s presence at Qingdao in conjunction with certain other recent developments. By itself, one country’s invitation to another to participate in a multilateral naval exercise does not represent a seminal strategic shift. Maritime forces – even those that share an adversarial relationship – often come together for a regional or collective cause. Indeed, the Indian Navy and PLAN have cooperated regularly in combating piracy off the coast of Somalia, and even exercised together in the northwest Pacific. India and China are, however, known to have separate geographical areas of maritime interest and are both distinctly uncomfortable with the other’s presence in their respective theaters of nautical influence. India’s wariness about Chinese military modernization and growing maritime prowess led New Delhi to consistently deny Beijing legitimacy in the affairs of the Indian Ocean – especially a voice in matters of maritime governance in regional institutions like the Indian Ocean Rim Association (IORA), fast perceived to be succumbing to China’s growing diplomatic and economic sway. Beijing likewise hasn’t been welcoming of Indian naval forays into the South China Sea. New Delhi’s political ambivalence about the growing Chinese presence in the Indian Ocean bears deeper analysis. India, like other Indian Ocean states has been overwhelmed by the enormity of the Maritime Silk Route. The project, which complements China’s “New Silk Road” – an economic initiative to develop regions along an ancient route connecting Western China with South and Central Asia – has clear short-term benefits, which Beijing has amply emphasized to all its potential clients in the IOR. The promise of commercial gains has, indeed, been a crucial factor in drawing regional support for the project. The financial payoffs, however, come at a price and entail long-term strategic implications that impinge on regional maritime security. While its finer details are still unclear, the MSR is said to involve the construction of ports, logistical stations, storage facilities, and free-trade zones. The MSR’s essential rationale is the leveraging of Chinese soft power. By undertaking a maritime initiative potentially beneficial for all regional states, Beijing hopes to shore up its image as a benevolent power. The idea is to use the project’s commercial returns to establish China’s legitimate interests in the Indian Ocean. Indeed, an allied proposal for a maritime cooperation fund announced by Chinese Premier Li Keqiang last year only makes it harder for regional states to resist the MSR. Interestingly, when President Xi Jinping first made the proposal during his visit to Southeast Asia in October 2013, the MSR was planned as a project meant to foster cooperation and goodwill between China and the ASEAN countries. China’s subsequent outreach to Sri Lanka and India, inviting them to join the project, revealed a broader vision spanning the entire Indo-Pacific region. The sales pitch of shared economic gains, however, does little to conceal the proposal’s real purpose: ensuring the security of sea lines of communications (SLOCs) in the Indian and Pacific oceans. Since African resources are China’s focus right now, the project is a surrogate for a giant Chinese SLOC running all the way from the East African coast, to the Southern coast of China – created, maintained and controlled by Beijing. In its ultimate form, therefore, the MSR could end up setting up Chinese logistical hubs in the Indian Ocean, linking up already existing string of pearls. At the heart of India’s seeming re-appreciation of its maritime perspective is an objective appraisal of these new realities. China’s burgeoning economic relationship with individual IOR states, the considerable financial and diplomatic investment in entrenching Chinese state-owned companies in Asia and Africa, and the vast infrastructure network being created in Asia will make it impossible for India – or any other regional power – to halt the PLAN’s thrust into the Indian Ocean. More crucially for India, Beijing’s considerable logistical and technological competence is matched by a commensurate political will and military strength to realize its grand vision. India’s policy elite realize the Indian Navy could soon face competition from the PLAN in the Indian Ocean. Following the MH370 incident, China has arguably been the most active participant in the rescue effort, with more than eleven naval and Coast Guard ships scouring vast tracts of the Southern Indian Ocean. 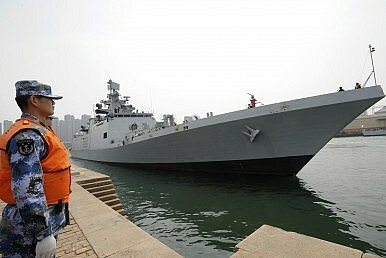 With its growing maritime capability, China’s navy is poised to play a growing role in the security of the Indian Ocean. Notwithstanding its strategic anxieties, therefore, New Delhi is required to make a politically prudent compromise. India’s predicament highlights a fundamental axiom: on the chess-board of international geopolitics, the context of a strategic proposition is as important as its content. India might be opposed to idea of being surrounded by Chinese maritime infrastructure and PLAN logistical outposts in the Indian Ocean, but the context of China’s rise in the region, and India’s own institutional weaknesses prevent it from forestalling such a possibility. New Delhi’s new pragmatic approach, however, has a sobering flipside: Beijing’s growing involvement in the security and governance of the IOR will eventually pose a strong challenge to India’s power and stature in the Indian Ocean. What seems like a win-win proposal today could prove to be the ultimate zero-sum proposition tomorrow – a complex equation that India will have little chance of resolving in its favor, unless it has the gumption to take hard strategic decisions. China’s gradual and organic appropriation of the Indian Ocean will only attenuate New Delhi’s geo-political equities and strategic influence in the region. Abhijit Singh is a research scholar at the Institute for Defence Studies and Analyses and looks at Maritime Security in the Indian Ocean. He is co-author of the book Indian Ocean Challenges – A Quest for Cooperative Solutions. *Corrected. The original erroneously mentioned official protests by Australia and Indonesia. In fact, the protests, as reported in the media, were apparently conveyed unofficially to China.